In the competition between therapy modalities in the United States today, group psychotherapy is clearly on the ropes. As I write these words, the Commission for the Recognition of Specialties and Proficiencies in Professional Psychology (CRSPPP) of the American Psychological Association is considering another petition offered by APA Division 49 (Group Psychotherapy) to have group psychotherapy declared a “specialty” practice among psychologists. Despite research that amply demonstrates the overall efficacy and cost-effectiveness of group psychotherapy (e.g., Burlingame & Krogel, 2005), as well as a demonstrated body of knowledge that cannot be taught in a single graduate course, it is far from certain that APA will grant specialty status to group psychology. Compounding the problem is the fact that graduate psychology programs across the country continue to reduce or eliminate training in group psychotherapy. As a faculty member at The Center for Group Studies, I am undoubtedly biased in favor of promoting clearly defined standards and specialized training for all clinicians who practice group psychotherapy. Like many clinicians, I can recount my own embarrassing stories of being thrown into leading therapy groups at a local agency with little more than a semester of group training. But the most eloquent argument I can offer for the value of more extensive training may be found in John Schlapobersky’s book, From the Couch to the Circle: Group-Analytic Psychotherapy in Practice. In this beautifully-written practice manual—aimed at both practitioners of group therapy broadly and practitioners of group-analysis particularly—Schlapobersky has provided us with a deeper understanding of the hows and whys of group therapy that extends the reach of the iconic classroom text in groupwork, The Theory and Practice of Group Psychotherapy (Yalom & Leszcz, 2005). In its broad focus on the unfolding moment-to-moment process of therapeutic groups, From the Couch to the Circle directs our attention to the phenomenological aspects of groupwork, providing a critical addition to the foundational texts in the field of group psychotherapy. In contrast to many books about group therapy, which “describe the vehicle, but not the journey or the destination” (p. 65), From the Couch to the Circle attempts to illustrate the intrinsic link between group theory and moment-to-moment practice through the use of 68 stories or clinical vignettes that are interspersed throughout the book’s chapters. These vignettes, drawn largely from the author’s own clinical practice over many years, are the beating heart of the book itself, providing both illustrations of the author’s theoretical ideas and a deep sense of the emotionally-significant moment that pulls the reader in. While taking care to disguise the identities of group members featured in the vignettes, Schlapobersky makes clear that the group members are “the true “owners” of the experience described” (p. 466), and he has included only those vignettes for which he has obtained consent to publish from his former group members (a rather remarkable feat, given that some of the vignettes feature group sessions from different settings over a 20-year span). One of the more moving parts of the book is the last chapter, “Conclusion and the last word,” in which the author reprints portions of letters from eight of his patients, sharing their reactions to the vignettes he had written and elaborating on the impact of their group analysis in their present-day lives. Throughout the book, the author’s abiding respect and admiration for his patients, especially for the specificity of their experiences and the metaphors they use, provides a satisfying emotional experience for the reader-practitioner. Indeed, some of the clinical vignettes moved me to tears as I found myself resonating with memories of deeply-affecting moments in my own groups. Aside from their emotional impact, these clinical vignettes also serve to illustrate some of the concepts that might be unfamiliar to an American practitioner. For example, in Chapter 4, “The language of the group: Monologue, dialogue and discourse,” Schlapobersky differentiates between three primary modes of speech that operate in groups: “Monologue,” he writes, “can be understood as a soliloquy, dialogue as the resolution of opposites or the search for intimacy, and discourse is the work of the chorus” (pp. 112-13). He maps the logical progression from monologue to dialogue to reparative discourse (“where an individual’s multiple inner objects are externalized and encountered in the group”) in the maturation of a psychotherapy group, then he deftly illustrates these concepts in vignettes in which both group members and the “conductor,” or group leader, contribute to the group work unfolding in a particular session (p. 113). Returning to Foulkes’ pioneering notion of a clinical method of “free-floating discussion” between three psychological objects (the individual, the conductor, and the group as a whole), Schlapobersky links his description of the three basic forms of group communication to Foulkes’ understanding of a therapy group as both a relational and semantic field, in which “the group’s productions [can be considered] as the equivalent of the individual’s free association on the part of the group-as-a-whole” (cited in Schlapobersky, 2016, p. 127). Hence the author attempts to demonstrate the link between the linguistic productions of a therapy group with the reparative, relational potential of the group: “Free-floating discussion” encompasses all three speech forms, he concludes, yet it is also “the means by which associative patterns are analysed and explored, new forms of meaning are constructed and a new sense of the individual emerges in the widening cycle of the whole” (pp. 131-32). The sheer scope of the book’s aims—purported to be accessible by everyone from psychotherapists with little group therapy experience to postgraduate trainees in the group-analytic model to policy-makers in mental health—makes From the Couch to the Circle feel like a rather daunting endeavor for the casual reader, as books with large ambitions often do. Nonetheless, the author’s introduction does provide suggestions about which section each audience segment might find most accessible as an entry point, and the author encourages readers to jump around freely within the text, as their interests and training dictate. Thus a clinician interested in introducing groups into her agency’s programming might focus more on the first seven chapters—the “Foundations” section of the book—while a group-analytic practitioner might find more to hold her interest in the “Dynamics of Change” section, comprised of Chapters 13 through 18, which focus on the “four domains” of communication (and the interplay between them), transference, projection, and the dynamic role of the group conductor. Two chapters are particularly note-worthy for teachers of group psychotherapy, namely, Chapter 6, “The range of applications in ten studies,” and Chapter 7, “Methods applications and models.” Chapter 6 describes an impressively wide range of applications of group analysis across 10 different practice settings, making clear the diverse appeal of the model for both short- and long-term therapy groups with different populations. Even more intriguing for teachers of group therapy, Chapter 7 offers a comparison of the group-analytic model to other psychodynamic models more widely used in North America, including the Tavistock model, Yalom‘s interpersonal model, the modern analytic model, and the Systems-Centered Therapy model. This chapter, based on earlier work written by Schlapobersky in collaboration with Malcolm Pines, compares a variety of common group formats along two basic axes or indicators, namely, “specificity of therapeutic goals” and “levels of leadership activity” (p. 201). The author’s concise summary of the basic tenets of each of six common models is thoughtful and balanced, and few group practitioners will be surprised by the conclusions Schlapobersky draws from the “modest comparative exercise,” yet the chapter offers an intellectually satisfying account of the shared premises and divergent foci of the dominant contemporary models of psychodynamic group work. 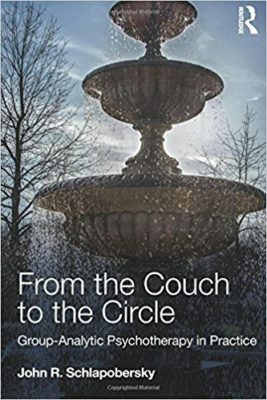 Despite its seemingly narrow focus on the group-analytic model, From the Couch to the Circle: Group-Analytic Psychotherapy in Practice is a eloquent, deeply poetic book that will appeal to any group practitioner who wishes to become a more sophisticated thinker about how to create groups that become agents of healing. More broadly, the book belongs on the bookshelves of any clinician who enjoys the meticulous rendering of therapeutic work as it unfolds in the moment-to-moment presence of a truly gifted practitioner. Burlingame, G. M., & Krogel, J. A. (2005). Relative efficacy of individual and group psychotherapy. International Journal of Group Psychotherapy, 55(4), 607-611. Schlapobersky, J. R. (2016). From the couch to the circle: Group-analytic psychotherapy in practice. New York, NY: Routledge. Yalom, I., & Leszcz, M. (2005). The theory and practice of group psychotherapy (5th ed.). New York, NY: Basic Books.